A 10% service charge, 7% municipality fee and 5% VAT apply. Including taxes , fees and round-trip ground transportation. All rooms are subject to a mandatory Tourism Dirham of USD 5.44 per bedroom per night. To enhance the experience of our loyal WPG travel family, Timeless Travels is proud to announce Emirates Airline as the official travel partner of the Wanna Play Getaway (WPG) 2019. Based on our historical air travel quantity (by city/region), Emirates has established the following hubs for non-stop flights to the United Arab Emirates (UAE) - Dubai International Airport. 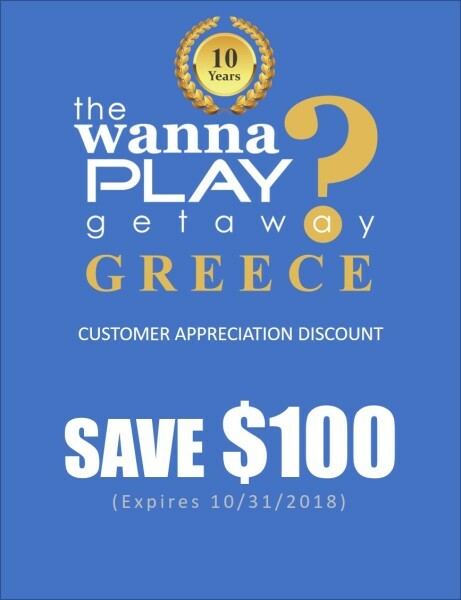 THANK YOU to EVERYONE who helped us celebrate our Wanna Play Getaway (WPG) 10 year anniversary by joining us for WPG 2018 in Greece. We VERY MUCH appreciate your support in making Greece an UNFORGETTABLE EXPERIENCE. And as a demonstration of our appreciation, we are offering you this exclusive customer appreciation discount. STEP 1: You will receive a personal email w/ a custom discount code. STEP 3: Timeless Travels will automatically deduct $100 from balance - applicable on your finale invoice.